I’m not done banging the drum about the power of creating marketing so useful, people would pay for it. In fact, I’m just getting started. Today is a big day. Today is launch day for the first official Youtility ebook – Youtility for Accountants: Why Smart Accountants are Helping not Selling. 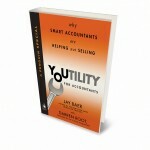 This is a $2.99 mini-version of my New York Times best-selling business book Youtility, customized for the accounting profession. Case studies, examples, how-tos all dedicated to making accountants and accounting firms more useful. It’s published by Portfolio, the business division of Penguin Books, who also published Youtility. I’m 100% sure you know someone that needs to read both these books. You have an accountant, right? Why not purchase this for him/her and gift it to them, or at least send them an email encouraging them to buy a copy for Kindle or Nook? 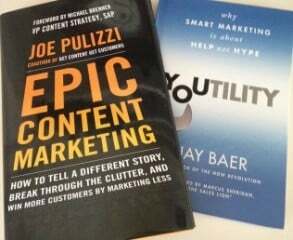 And, if you buy a copy of Youtility for Accountants + a copy of Youtility (hard cover or ebook) and email me a receipt at jay@jaybaer.com by March 14, I’ll mail you a hardcover copy of my pal Joe Pulizzi’s awesome book Epic Content Marketing. (USA addresses only). This is the first in a series of Youtility ebooks I’ll be producing. We have Youtility for auto dealers, insurance agents, and realtors in the works, with more on the way. If you have thoughts on what would make a good vertical category for Youtility, please let me know. 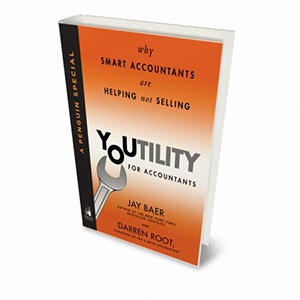 I wrote this book with my friend Darren Root, CPA who advises hundreds of accounting firms across the USA. He’s also the co-author of The E-Myth Accountant. Here’s a video from us talking about the book and how it fundamentally changes the way accountants market and build their businesses. Your accountant will love you for this, and that’s not a bad thing come April 15. Is your accountant bad at marketing? I’m going to go out on a limb here and say yes, because that’s quite often the case. Since you’re reading Convince & Convert, you’re most likely pretty darn good at marketing, or at least unusually interested in it. This is your chance for you and I (and Darren) to work as a team to save your accountant from the bad marketing practices they may be clinging to like Jared Leto clutching an Oscar. Thanks as always for your support, and let me know what ideas you have for other Youtility vertical markets.